There are bulls and bears on Wall Street, but in Micron Technology, Inc. (NASDAQ:MU) the atmosphere is decidedly optimistic and for some very good reasons. But for bullish Micron stock investors, putting a cap on expectations with a bull call spread makes good sense without being a compromise. If one believes in MU’s recent upside guidance, a lopsided and clearly bullish analyst community and an improving bullish MU stock price chart, there’s a lot to like about the stock’s prospects going forward. But what about the bears? Obviously there are a few. Despite shares having rallied nearly 90% in the past twelve months, the fact remains Micron stock has badly lagged the broader market and its large-cap semiconductor peers during the past few years. The main argument from MU stock’s non-believers is to promote dire warnings of waning demand within Micron’s bread and butter DRAM and NAND memory markets. The bear case is not a new view and the caution has served investors well in the past. However, a more recently developed bullish narrative of reduced price volatility and secular growth in Micron’s markets is, plain and simple, more strongly aligned with what management, Wall Street and Micron stock are telling investors willing to listen. The last time I wrote about MU stock in early December, shares were grappling with a bearish correction. After hitting fresh three-plus year high out of a massive corrective cup-shaped base, a quick-to-develop pessimistic narrative also offered investors an opportunity to enter Micron stock at a discount to fair value. The entry point did go on to mark a first key corrective low in shares. Now and over the last two and one-half months Micron stock has managed to improve its technical picture in putting together a second pivot low in February and forming a bullish ‘W’ above the prior corrective cup. 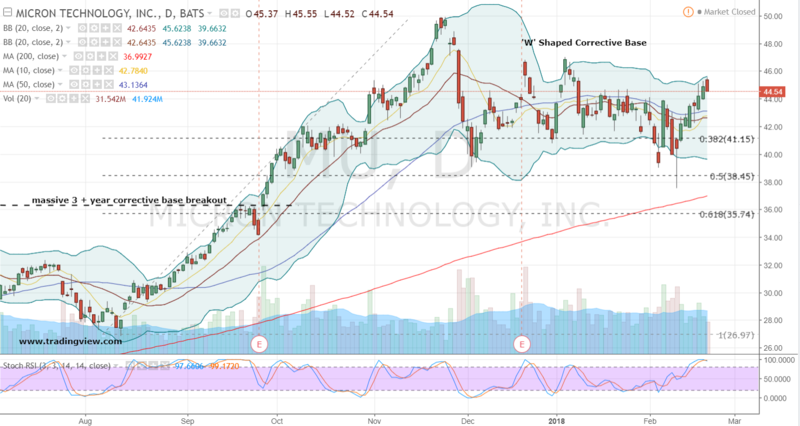 It’s our view the constructive MU stock price pattern should lead to an eventual breakout above the $47.08 mid-pivot, followed by a secondary breakout to new intermediate highs above the base high near $50-per-share. Previously I detailed a bullish modified fence combination in Micron stock for even money. The spread enjoyed a couple opportunities to cash in on ballooning of profits. In January, shares put the long call vertical almost fully in-the-money twice and worth nearly $3 intrinsically. Reviewing Micron options, I’m still a fan of this strategy. However, given the technical assessment of shares being in position to travel higher from here and not wanting MU to threaten the current healthy base structure with additional weakness, an out-of-the money bull call spread is favored. One such combination of interest is the April $48 / $55 call vertical. Priced for $1.32 with shares at $44.57 this spread offers bullish traders a way to reduce long premium risk, limit potential losses to a small debit equivalent to roughly 2.50% of Micron stock and offer up to $5.68 in profits. The bottom line here? With earnings in late March and shares of MU stock having a history of price volatility, this vertical spread makes all the more sense in our view — and if all goes as planned, it could offer up a lot in profits too. Disclosure: Investment accounts under Christopher Tyler’s management do not currently own positions in any securities mentioned in this article. The information offered is based upon Christopher Tyler’s observations and strictly intended for educational purposes only; the use of which is the responsibility of the individual. . For additional market insights and related musings, follow Chris on Twitter @Options_CAT and StockTwits. 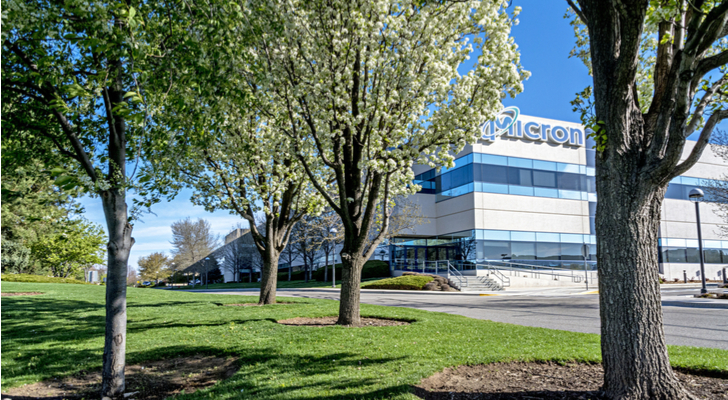 Article printed from InvestorPlace Media, https://investorplace.com/2018/02/micron-technology-inc-mu-stock-buy-again/.